Considering dental implants in Broomfield? Dental implants are a modern day solution to an age-old problem and are most likely the best choice for restoration of missing teeth. These implants replace teeth that are missing due to disease or injury. The implants that Retro Dental Broomfield uses for our patients are extremely strong, permanent and natural looking. Patients have found them to be a wonderful solution for gaps in their smiles caused by lost teeth. We use the latest advancements with our implant placement with CT scans, which helps us determine the best location to place the dental implant within the jawbone. You will love the implants because there will never be a problem with slippage. This means you can eat, speak and smile with ease and assurance. A dental implant is a titanium post that is placed directly into the jawbone and designed to create a stable foundation for a functional tooth. Looking at a smile with dental implants is like looking at a smile with natural teeth. Missing teeth take away from the beauty of your natural smile. They can also lead to bone loss which changes the structure of your mouth and jaw. Dental implants will restore strength to your bite and beauty to your smile. The dental implant process begins with a titanium peg inserted into a healthy jaw. As the peg heals, it causes what is called osseointegration, which enables the peg to integrate with your bone and gums. This process allows the titanium peg to literally become part of your jaw. Next, you will have an abutment or post placed on your titanium peg, which will allow for the third step. This step is the placement of your new tooth, which is custom made to match the shape, color, and size of your remaining teeth. 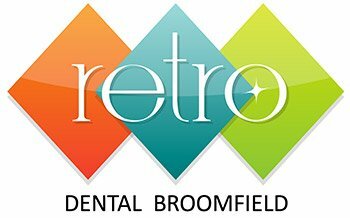 Here, at Retro Dental Broomfield, we will provide you with an expertly crafted and installed dental implant and crown that can last for decades and will be indistinguishable from your natural teeth. We place great pride in our implants, as they achieve the ideal results. You will forget you ever had a gap in your smile!